In years past, underground non-metallic pipes, concrete storm and sewer systems, lines without tracer wires, storage tanks, and septic systems were unlocatable. GPR resolves this, providing you with an accurate understanding of your property’s sub-surface infrastructure. By rolling the GPR equipment in a grid pattern over the property, with radar shooting as deep as 20 feet into the ground, our professionally trained technician can see abandoned septic tanks as well as known and unknown utilities. 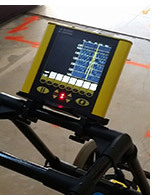 We can perform utility location and GPR together or individually, depending on your needs and the scope of the project.